Just recently I watched the movie, Hilary and Jackie (1998 Anand Tucker) which deals with the life of the celebrated cellist, Jacqueline du Pré. That story brought to mind a contemporary of du Pré, Carmen Costigan, whose life, accomplishments and tragic death closely mirrored those of the more famous musician. Carmen was born in 1946 – the only child of Michael and Ysabelle Costigan. Her father had been involved with Sinn Fein, in Eire, but moved to London at the conclusion of WWII, where he owned and operated a garage business in Norwood, near to the Costigan home. Carmen’s mother, Ysabelle, was of French Moroccan extraction and had been a member of The Comédie-Française in Paris before the war. In their tidy Norwood ‘semi’, she gave acting and singing lessons to the sons and daughters of the South London middle classes. The young Carmen prospered in this creative environment but it was clear to Ysabelle that her daughter’s real talent lay with the piano. And so, from the age of 6, until she was 14, Carmen received the best tutoring available, including a spell with the redoubtable Joyce Hatto at Crofton Grange. It was clear that Carmen was something of a prodigy and she won many accolades and prizes for her playing in the recital competitions that took place all around Britain. In April, 1961, Hatto arranged for Carmen to give a short recital as a prelude to her own appearance as a soloist in a concert at the prestigious Wigmore Hall in London. The whole concert was to be broadcast live on BBC radio. The evening was a triumph and brought Carmen to national attention. She played pieces by Satie, Poulenc and Debussy with such fluidity and precision that musicologist, Denis Stevens, urged Walter Legge, who was also present, to use his influence to persuade EMI to put Carmen under contract. Ysabelle now became Carmen’s full-time manager but the pressure of dealing with Carmen’s formal education and continuing musical tuition, agents, journalists, venue owners and EMI soon proved to be beyond her capability. Also, Carmen, an attractive teenager in the public eye, was dating a series of young men. One of these suitors was emerging jazz talent, Roy Budd, another product of the competition circuit. Budd proved to be the only fixed star in Carmen’s life as, over the next ten years, she seemingly wasted all of the talents, prospects and relationships that defined her future on that April evening in 1961. What followed was not a steep decline. Rather, there were troughs and peaks scattered along a gradual descent. There were bouts of alcoholism punctuated by times of stability and success notably her appearance at the Albert Hall in 1966 with Jacqueline du Pré and Daniel Barenboim. And in 1967, her recording of Ravel’s Piano Concerto in G major for EMI won the coveted Gramophone Magazine’s Editors Award. But her appearances and output were becoming increasingly sporadic and her relationship with Ysabelle had all but disintegrated by 1968. Her affairs, too, were public, noisy and always disastrous. George Best, Tom Jones, David Hemmings and, briefly, Daniel Barenboim were amongst a string of lovers that provided lurid fodder for the tabloids and chat shows. It could only end badly – and it did – with Carmen collapsing at a party for her 23rd birthday in May, 1969. Ysabelle, of course, rushed to her side and persuaded her to return home to Norwood to complete her recovery, once released from hospital some three months later. By mid-1972, Carmen was fully recovered and – now 26 – better equipped to reconcile the demands of her public life with her need for a private life. It was at this time that she met Michael Stokes, son of Donald Stokes (later Baron Stokes), the Chairman of The British Leyland Motor Corporation. Michael believed himself to be something of an entrepreneur and soon persuaded Carmen to allow him to manage her career. Initially, the new arrangement bore fruit. Some well-chosen appearances on radio and television, discussing her past and the come-back; a few guest appearances at concerts and festivals – and then a performance of Mozart’s Piano Concerto No 10 for two pianos, with Daniel Barenboim in Paris in December which was widely acclaimed. At the beginning of 1973, both HMVand Deutsche Gramaphon approached Carmen to discuss a recording contract. But Michael persuaded her to sign a special deal with British Leyland in conjunction with HMV. At that time it was not unusual for recordings, particularly of classical music, to be sponsored by private industry. Tobacco companies frequently released albums under their proprietary ‘label’. In this case, Leyland were about to launch their new family vehicle, the Austin Allegro, and Michael’s plan was to produce an album entitled ‘Allegro’, featuring Carmen. So in June that year Carmen went into the HMV studios to record the 12 selections for the album together with the Royal Philharmonic Orchestra. 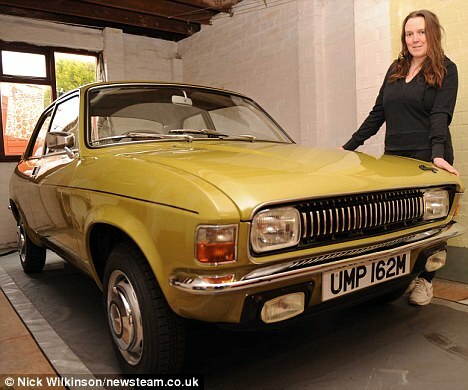 As part of the publicity campaign for the album, Carmen was given the keys to a new, Series I Allegro. Michael also arranged for David Bailey to do the photography and sleeve design for the album. Carmen and the RPO completed the dozen tracks within a week and the tapes were ready for mastering. But on a wet friday night on her way back to Norwood from the studio,, Carmen was killed instantly when her Allegro skidded out of control and hit a power pole, about a mile from her home. The media storm that followed ensured that the true tragedy of Carmen’s life and death was ignored in favour of speculation as to her state of mind, her alcoholism, her lovers, her ‘chequered history’ as the Daily Mirror put it. The album, ‘Allegro’, was canned, as was all associated promotional material. No one at Leyland wanted to be associated with the accident. In a short while the story fizzed out and Carmen became just another 27-year-old musician that never made it to 28. Research was often difficult for this piece. However, an old friend with contacts has told me that he may be able to obtain access to some of David Bailey’s art work for ‘Allegro’. If that comes to pass, I will publish a post scriptum to this blog.